A major fault on Wednesday forced changes to BBC News and BBC Radio output. 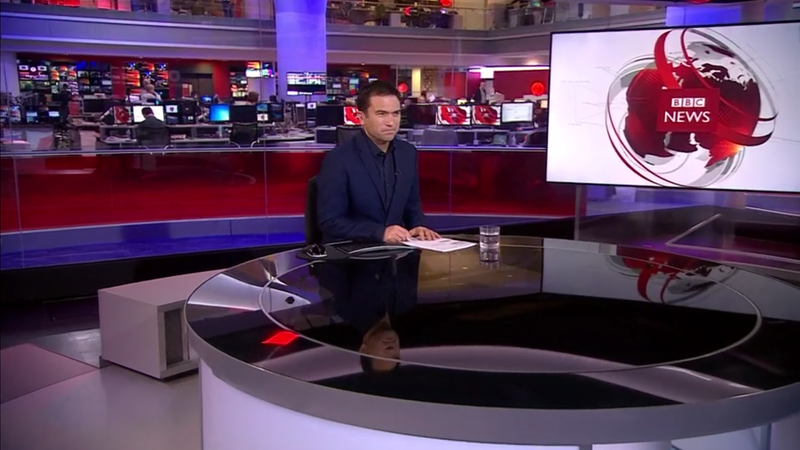 The evening line-up on the BBC News channel and BBC World News had to be changed after a Broadcast Network Control System fault which developed mid-afternoon and affected routing of content and connectivity between studios. As a result, all BBC News operations were forced into the main newsroom-facing studio, Studio E, for the evening, meaning that programmes including Beyond 100 Days and Outside Source were presented with standard BBC News branding, with no joint presenation from Washington on Beyond 100 Days and no touchscreen for presenter Ros Atkins on Outside Source (pictured). The 8pm standard news bulletin on the BBC News channel was simulcast on BBC World News. Newsnight had to be moved to the BBC's virtual studio, studio A, with a backdrop to mimic the regular studio. Newsday on BBC World News was replaced by a standard World News bulletin at 23:00 GMT. BBC Radio operations in and out of London were also affected, with Stuart Maconie extending his Salford-based 6Music show until 4:45pm when Steve Lamacq was finally able to take over on location. Maconie seized the opportunity to welcome listeners who didn't normally tune in before 4pm. Over on Radio 4, the 4pm pips became one of the first casualties of the fault. Other behind the scenes activities within parts of BBC Radio had to be curtailed while engineers rushed to curtail disruption to output. Only last month, BBC News was affected by a different fault, linked to new software that's recently been rolled-out at the BBC. That fault resulted in some television news output being abandoned and other programmes moved out of New Broadcasting House to Millbank.